Dallas Stars center Shawn Horcoff (10) and right wing Alex Chiasson (12) and center Rich Peverley (17) celebrate Peverleys goal against Pittsburgh Penguins goalie Marc-Andre Fleury (not pictured) during the second period at the American Airlines Center. DALLAS — In a week that started with the Dallas Stars losing 4-1 on the road to the Nashville Predators, those same Stars finished the week with an impressive 3-0 blanking of the current Eastern Conference-leading Pittsburgh Penguins at American Airlines Center on Saturday night, running their current win streak to three games. But not only have the Stars found a nice groove with three straight victories after starting the month of January1-8-1, but Dallas has also outscored their last three opponents, the Minnesota Wild (4-0 on Tuesday), the Toronto Maple Leafs (7-1 on Thursday) and the Penguins by a combined 14-1. And as if that wasn’t enough cause for optimism from the Stars faithful, the Dallas power play, which was simply abysmal, especially at home, for much of the earlier part of the season, has now also turned a corner. Dallas has scored at least one power-play goal in seven straight games and is 9-for-24 (37.5 percent) during that stretch, a nice turnaround for that unit. The Stars’ penalty kill has also been surging of late, killing off 15 straight opposing power plays over the past five games, including all four against the Pens, who have one of the top power plays in the entire NHL. 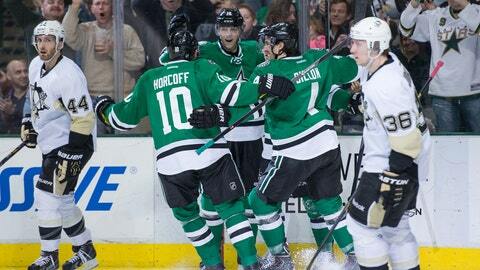 "The last three games have all been excellent in all three zones," Dallas head coach Lindy Ruff said. "This one against a highly skilled team and taking care of special teams probably knocks the other two down a little bit." One of the truly unsung heroes of the win over Pittsburgh was none other than second-line center Cody Eakin, who along with Antoine Roussel and Ryan Garbutt was tasked with the unenviable task of holding the Pens’ top line, a trio featuring Sidney Crosby, in check, something they did for most of the night. "We were sharp, quick and crispy and it worked out for us," Eakin said of the win. Dallas also got yet another stellar performance in the crease from Kari Lehtonen, who stopped all 24 shots he faced to earn his second straight shutout. Not only did No. 32 get his third shutout of the season and 25th clean sheet of his career, but the affable Finn also picked up an assist for a second straight game, giving him four helpers on the season. "I’ve been feeling good mentally and physically," Lehtonen said. "Being a goalie is a funky business. I can feel good and still things cannot go my way." The Stars, who are a perfect 3-0-0 on their current five-game homestand, will return to the ice Monday against the Colorado Avalanche, who currently sits fifth in the Western Conference standings. The Avs are 9-3-2 over their last 14 games. And as Dallas looks to extend their current win streak to four or maybe even five as New Jersey visits on Thursday to conclude the homestand, Ruff can’t help but reflect albeit quickly on the turnaround his club has showed this week, since a 20-minute closed-door meeting called by the veteran head coach with the entire roster on Tuesday morning, a gathering also attended by Stars general manager Jim Nill. "I think we’ve been locked in," Ruff said. "There has been energy in our game. We don’t have a lot of long shifts and there haven’t been a lot of turnovers in the neutral zone."